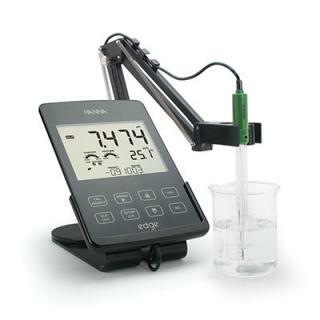 Edge is the world's first hybrid meter and the latest innovation from Hanna Instruments offering some of the most advanced technology for measuring Dissolved Oxygen. The smart, slim-line design means Edge can be used as a hand held, wall mount or bench top meter. 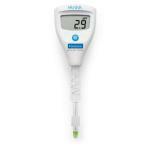 Combined with sophisticated technology, it delivers fast accurate results with laboratory grade precision whichever format you choose to use. Cutting-edge design, capacitive touch keypad and an intuitive user interface are just some of the attributes that make this meter stand out. DO is measured through a unique digital electrode. Connected via an easy plug-in 3.5mm connector, this smart electrode enables Edge to automatically recognise and store sensor type, ID and calibration information. Programmed for basic and advanced modes, Edge offers simplified screen features for routine measurements or detailed data display. It warns users if the electrode is not clean or if buffers are contaminated during calibration using the exclusive Hanna CAL-CHECK feature.